How can we study organizations from a discursive perspective? What are the characteristics, strengths and weaknesses of each perspective on organizational discourse? To what extent do discourse and communication constitute the organizational world? This accessible book addresses these questions by showing how classical organizational themes, objects and questions can be illuminated from various discursive perspectives. Six approaches are presented and explained: semiotics, rhetoric, speech act theory, conversation analysis/ethnomethodology, narrative analysis, and critical discourse analysis. These six perspectives are then mobilized throughout the book to study coordination and organizing, organizational culture and identity, as well as negotiation, decision making and conflicts in the context of meetings. The unifying thread of this volume is the communicative constitutive approach (CCO) to organizations, as implicitly or explicitly advocated by the great majority of organizational discourse analysts and theorists today. Throughout Organizational Discourse, this theme will help readers distinguish between discursive perspectives and other approaches to organizational life, and to understand how discourse matters in organizations. 1 What is (organizational) discourse? How is this book organized? An essential, high-impact resource for all organizational discourse scholars. Cooren offers a definitive field guide illustrating how discourse and CCO researchers move from concept to data analysis to theory building. Cooren enables readers to see how the pieces of discourse research fit together to produce significant results. For students of language, communication, and organizations, François Cooren has written a terrific introduction to organizational discourse analysis. His review of six discourse approaches is bolstered by his extensive research in the field and his goal to help readers understand the organizing potential of language. This organizing potential is key to knowing how organizations are communicatively constituted. The writing in this book is clear, accessible, and inviting. I highly recommend it! This volume provides a superb integration of six discourse perspectives interwoven with the thread communication constitutes organization. It not only explicates these approaches but also employs each of them in exemplars of enacting coorientation and organizing, performing identity and culture, and negotiating decisions. Overall, it is an ideal text for teaching organizational discourse analysis. 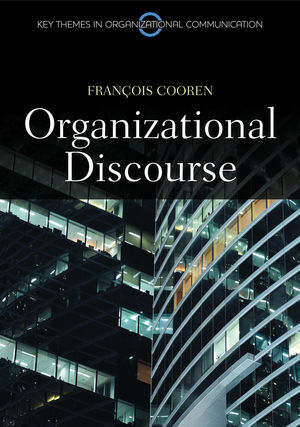 François Coorens new book, Organizational Discourse, is a clear, well informed, sensitive account of varied discursive approaches and topics in organizational studies. Cooren is very skilled and systematic about explaining technical terms and assumptions lucidly and with sustained examples. ... while the books special focus on discursive issues makes it most valuable as a text for courses concentrating on organizational discourse/communication issues, its breadth makes it a real option as a textbook, or a half-term text, in more generalized organizational behavior and communication classes.